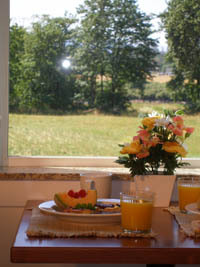 Valentine's Day Sweetheart Getaway: Romantic dining package at McKenzie Orchards Bed and Breakfast. Welcoming fire in our great room. Pretty dining room table ready for dinner feast. Perfect crab cake drizzled with red pepper sauce. Beautiful meal to tantalize your taste buds. 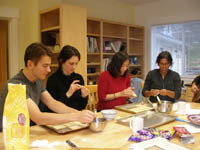 Karen's cooking classes are fun and educational. Join us for a Valentine's getaway Saturday night Feb. 16, 2019! Don't miss out. Want a little romance for Valentine's Day? sipping champagne and nibbling appetizers. A full course romantic dinner for two in our cozy bistro. complete with roses and chocolates. 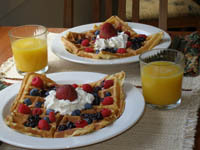 A perfect Valentine's breakfast in the morning. Relax in front of a roaring fire in our spacious great room bistro with vaulted ceiling and gorgeous view. 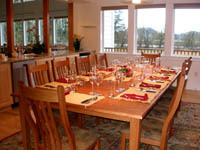 Enjoy an entertaining cooking class followed by an elegant meal paired with wines. Cuddle and snooze in your luxurious guest room, with cozy gas fireplace and deluxe 2-person bath or shower. Check in early and relax! 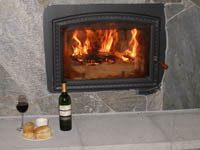 Watch the cooking demo, then hang out in front of the fire. Dinner served at 7:30 pm. 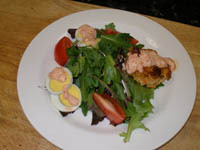 Appetizer: Perfect crab cake drizzled with roasted red bell pepper remoulade sauce. Paired with Willamette Valley sparkling wine. Salad: Orange, onion, avocado salad on a bed of spring greens with orange dressing. A stellar salad. 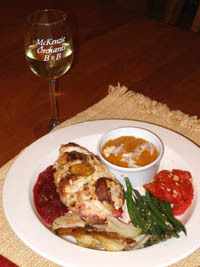 Main Course: Nut crusted chicken breast, sauteed until crispy brown, served with a cranberry-raspberry garnish. Dessert: Molten chocolate cakes, decorated with whole raspberries and served with a scoop of housemade vanilla ice cream -- beautiful and delectable. 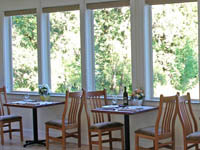 Includes appetizers, champagne, demo, dinner, glass of wine, Saturday overnight, and breakfast. For a flight of wine pairings with each course, add $20 per person. 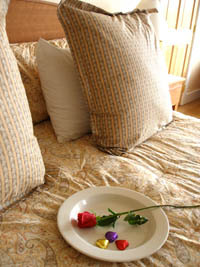 For an even more romantic time, stay a second night B&B (Friday or Sunday night) for only $150 plus 9.8% room tax. You get your choice of any room; this is a very special rate for the package. * Room tax of 9.8% on the room stay value of $175 will be added to the total. Please contact Karen Reid at 541-515-8153 to reserve. Cozy and romantic bistro table seating. Breakfast overlooking the river in our Bistro. For Valentine's Day, roses and chocolates, of course.